"Science Behind the Ancient Tamil's Traditions & Customs"
Originally Dravidian [Tamilians] religion far preceded Aryan arrival, not just in the Tamil-speaking country but all over India;Also their society was egalitarian, untainted by the hierarchical and oppressive caste system of the Aryans; and above all, the possibility that that most important present Hindu deity, Shiva, might be Dravidian in origin . Shaivism is the true and original religion of all ancient Tamilians at the time and it is called “Tamilian religion,” tamiḻar matham . It is also the most ancient religion of India, predating Sanskritic Hinduism by many centuries.However from Beginning in the third century CE, migrating brahmans and other persons influenced by Vedic and epic traditions were also becoming a part of the Tamil landscape and again from Pre-Modern Period ,European influence had begun to leave its impact on Tamil culture and religion.However,Still in present days,Majority of Tamils are Shaivites by birth,who practice Shaiva Siddhanta. Tamils people are generally deeply religious but are never religious fanatics.They go to temple to pray whenever possible but not compulsory. There is no hard and fast rule on temple visits.Every important step in the progressive life of a child was a festive occasion for the parents and family and they celebrated with appropriate ceremonies.The Tamil man is devoted to his family and his life is family centered and the family comes first. Though ,Personal hygiene is a key component of human well-being regardless of religion, culture or place of origin,in some populations,hand hygiene practices are deeply influenced by cultural and religious factors and these practices / hand cleansing patterns, according to behavioural theories,are most likely to be established in the first 10 years of life. Hand use and specific gestures take on considerable significance in certain cultures.The most common popular belief about hands, for instance in Tamil culture, the left hand is primarily used for personal hygiene purposes and hence using left hand to receive or hand over anything from anyone is considered as an insult. After attending a funeral,both men and women stay outside the house.Then they go to the well and have a bath, wash all their clothes and then only enter the house. This is preventing any infection from the funeral house. This is more prevalent in the villages.Once a person is dead, the body looses it ability to fight bacteria and starts to decompose. The people who attend the funeral are exposed to the dead body and hence the bacteria that participate in the decomposition of a dead body. That is the reason why they are asked to bathe immediately after the funeral, before touching anything or anyone.You have to realize that this custom originated many centuries ago. At the time the sanitation and cleanliness practices were different.Technology available was different.What we forget while following such rituals is that they might make sense in that era and may or may not make sense now. We have to decide that.Also Every person visiting the house of the dead person during the mourning period is also believed to suffer from pollution.Similarly,the first thing; he is expected to do on leaving the house of the dead person is to have purificatory bath. Only after this bath, he is entitled by custom and usage to have a drink of even a glass of water or to eat and enter the main parts of his own house.The house where death was occurred is considered polluted or thudakku [unclean] and cooking is not done for few days.The neighbours supply them food.I think, the idea is that the family should not have to think about cooking or feeding the children during this said period of deep sorrow.Also,I think,Thudakku, after death is something similar to what we call "quarantine" now ? Since in the old days the reason of the death may not be known, everyone just played safe and stayed, may be, away from the family.when there were no discoveries, it was nearly impossible to know at that time diseases like :Meningitis ,Chicken pox .Tuberculosis (TB),Influenza ,& that disease can spread through air, water & food.So, telling them to stay away will not solve the problem because of emotional attachments etc, they will not follow guidelines, But people have to stay away from that place for some time to let the place become sterile itself which can be thudakku period.No one was sure that whether someone from the same family is also the carrier of same disease or not, so how to stop them from going to public places where people usually stay in closed premises & share same air space, mostly it was temples at that time. So ,I think thudakku was the answer. If anyone in the house suffers from an infectious disease like chicken pox, a bundle of Neem or margosa leaves[வேப்பிலை] are hung at the gates of the house indicating there is an infection – a brilliant method of isolation.Also Neem act as anti bacterial, anti parasitic, anti fungal, anti protozoal and anti viral thus helps in protection from all the microorganisms, which are always ready to invade in our body causing serious ailments.Neem tree is commonly known as margosa tree in English . Also,Neem is one of the best remedies that can cure the pox and prevent the infection from spreading further. On the forehead between the two eyebrows , which is the seat of memory and thinking. It is known as the Aajna Chakra in the language of Yoga — a spot considered a major nerve point in human body since ancient times. 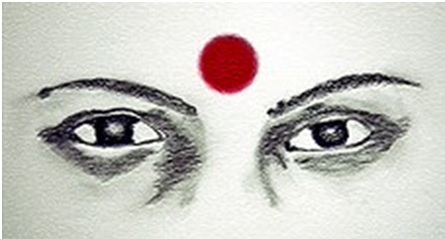 The Pottu[bindi] is believed to prevent the loss of "energy".The red 'kumkum' between the eyebrows is said to retain energy in the human body and control the various levels of concentration.The blood supply to the face muscles is facilitated: While applying kumkum[குங்குமம் kungumam] the points on the mid-brow region and Aajna Chakra are automatically pressed. This facilitates the blood supply to the face muscles.The entire body emanates energy in the form of electromagnetic waves - the forehead and the subtle spot between the eyebrows especially so. That is why worry generates heat and causes a headache. The tilak and pottu cools the forehead, protects us and prevents energy loss. Sometimes the entire forehead is covered with Santhanam[சந்தனம்/Sandalwood] . Using plastic reusable "sticker Pottu[bindis] is not very beneficial, even though it serves the purpose of decoration. Henna[மருதாணி] is typically applied during special occasions like weddings and during festivals. Henna is applied to hair, hands, and feet and believed to bring good luck. Our ancestors have advised applying heena to hands, to the bottom of the feet, and hair, etc, especially at the onset of rainy season.This was because during rainy season, the susceptibility to get infected by germs was manifold and henna’s anti-fungal and anti-bacterial properties were believed to fight those germs. Though henna is seen as an adornment, scientifically, henna extracts show antibacterial, antifungal, and ultraviolet light screening activity. Henna is anti-fungal and can be effective against psoriasis[A noncontagious inflammatory skin disease ]. Henna is most commonly used as a natural hair and skin dye, but henna also contains a compound called lawsone[hennotannic acid], which is the what gives heena its antibacterial and antifungal capabilities. Henna is effective against prevention of dandruff too.